Shikantaza (clockwise): Bernhard Geiger, Tanya Saunders, Doug Miller, Brandon Lewin. The jazz trio Shikantaza will perform with Tanya Saunders at the South Brunswick Jazz Café on Friday, September 9, 2016, from 8 to 10 pm. The word shikantaza, translated literally as just sitting, refers to a form of Japanese Zen Buddhist meditation. 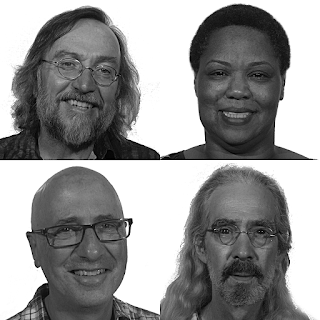 The musical group (Doug Miller on piano, Bernhard Geiger on acoustic bass, Brandon Lewin on percussion, and featured vocalist Tanya Saunders) explores the jazz canon, making familiar works uniquely their own, as well as offering original compositions developed improvisationally. Their music draws inspiration from many genres. To read more about Shikantaza and to listen their music, click here. The South Brunswick Jazz Café is located at the Herb Eckert Auditorium in the Senior Center, South Brunswick Municipal Complex, 540 Route 522 in Monmouth Junction. Admission is $6 at the door. Doors open at 7:30 pm. This performance is a BYOB event. There will be one intermission. For more information, call 732-329-4000, ext. 7635, or click here.